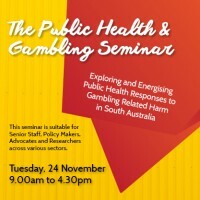 Exploring and Energising Public Health Responses to Gambling Related Harm in South Australia at a seminar on November 24. Relationships Australia SA is a large service provider of tertiary counselling responses to problem gambling in SA. We are conscious of the seriousness of this wide reaching issue and the importance of engaging extended community and key stakeholder organisations in a strategic public health approach into the future. As we know, harm from gambling is profoundly stigmatized and silenced, often subject to moral judgement or seen as a political matter too difficult to broach. In SA, screening for gambling harm by other health and community services is underdeveloped and there is little involvement by public health experts and local government in policy discourse or prevention initiatives. Some of Australia’s leading thinkers and outstanding speakers in the field will join us on this day to stimulate and inform this important conversation with invited delegates. See below for program outline. This seminar is suitable for Senior Staff, Policy Makers, Advocates and Researchers from State and Local Government, Universities, and across the Community Services Sector. Please join us in making a significant contribution to improving public health responses to gambling harm in our state. Lunch, morning and afternoon tea provided. There is no cost for this seminar. As places are limited, please RSVP by Thursday 19 November online www.trybooking.com/JFQW or by calling 8216 5200.